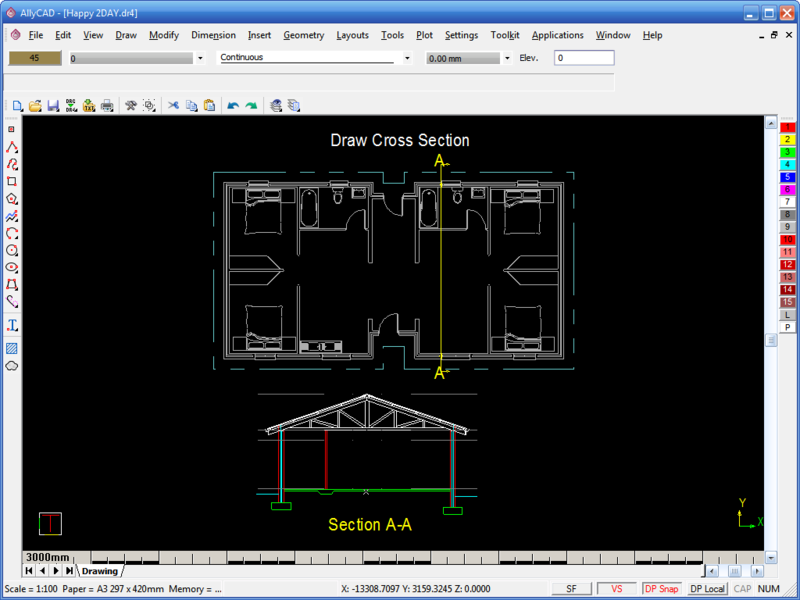 The Architectural Toolkit speeds up many of the activities that are used to draw building plans. Comes with SABS 0400-1990 building standards. 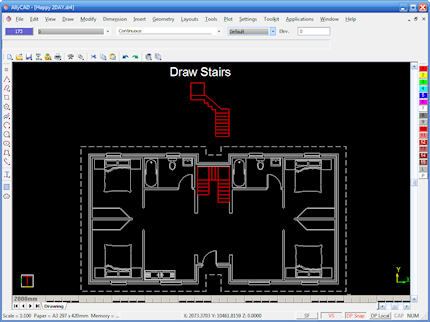 The Architectural Toolkit speeds up many of the activities that are used to draw building plans. You can draw the external and internal walls of a building easily and joins between walls are automatically cleaned up as you draw. Add the roof plan by simply indicating the outside walls and specifying the overhang. 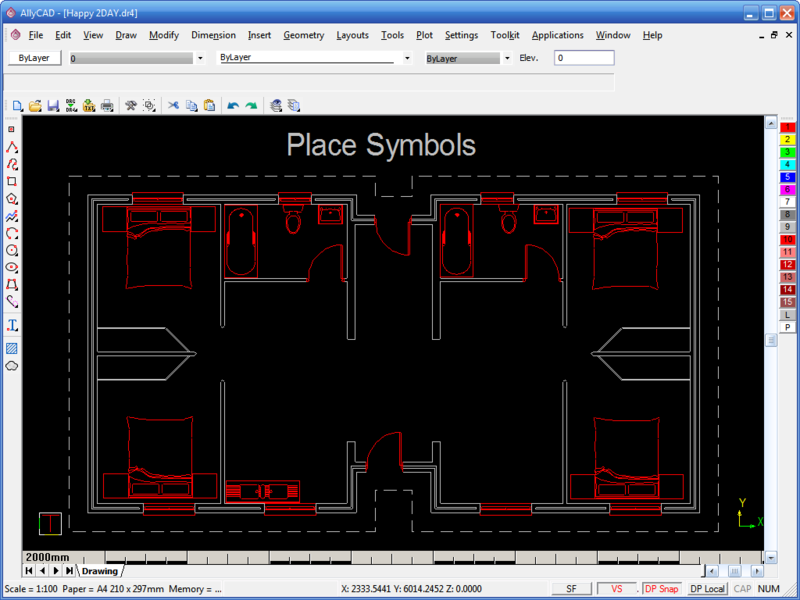 Insert door, window and fitting symbols and generate elevations and sections quickly. 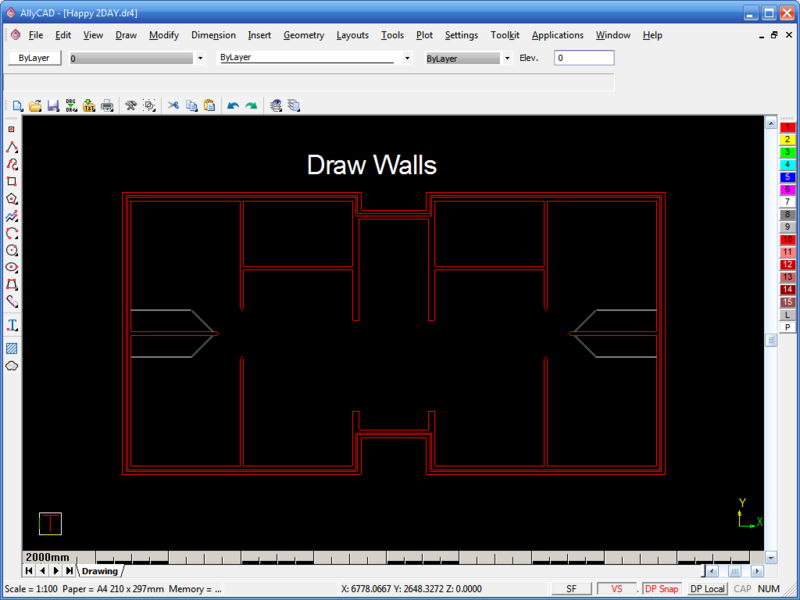 The wall setup dialog allows you to edit, save and reload previous internal and external wall types. It also specifies whether you would like foundation or cavity walls included. You may swap between the external and internal wall types with ease and can specify whether you would like the wall to track around an existing line, or to be drawn fresh. 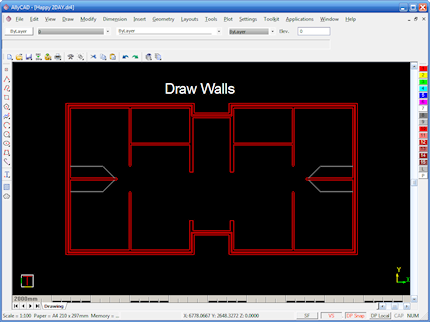 Other handy features allow you to specify whether the wall is drawn with inside or outside justification, whether your drawing direction is clockwise or anticlockwise and which layer you would like the wall drawn on. You may even specify the wall end finish. This includes what your start and end angle should be, and whether the ends of the walls should be closed. This function is used to add a roof line to a plan. The roof line is used to draw the roof elevation and cross-sections. Adding a roof line to the elevations is easily achieved by first specifying the eaves overhang, pen colour, linetype and the layer in which you would like the roof line to be drawn in. The roof line is then tracked around the existing plan layout in a matter of seconds. 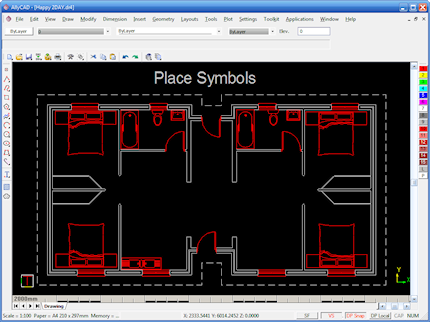 This architectural submenu is used to place symbols on the plan view. For ease of reference, the symbols for doors, windows, sanitary ware, kitchen units and other symbols, have all been grouped in a tree structure, and now appear in a symbol library tree. Symbols are placed easily on the drawing by clicking on the desired symbol library in the tree. This loads the relevant library and a dialog that shows a selection of symbols in the library. These can then be selected and placed anywhere on the drawing. Symbol options include, allowing the symbol to snip the lines around it, to be rotated, to be scaled in the x and y planes or to auto-rotate itself onto a line. Users can also specify different symbol library trees by changing the path in the architectural setup dialog. 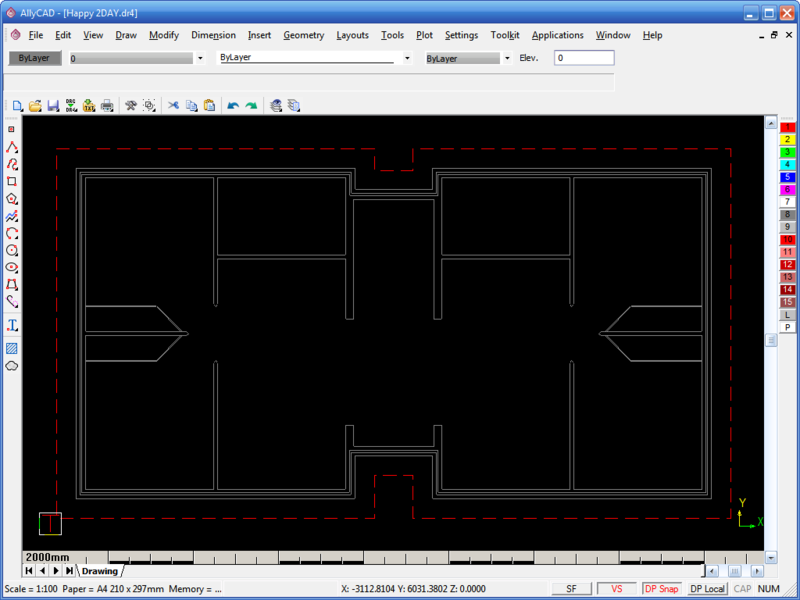 This function draws cross sections from the existing plan view. Cross sections may be drawn by specifying the external and internal walls, as well as the trusses in the plan layout. 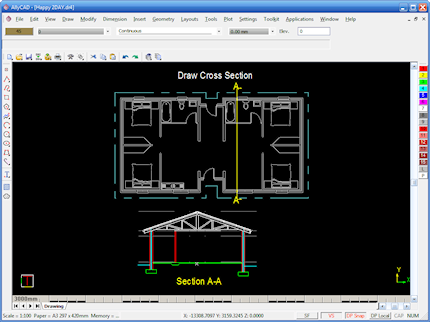 Section lines and labels as well as truss specifications and foundations, are all specified in the cross section setup dialog. 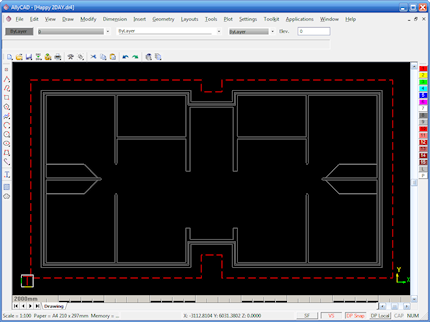 Section lines are automatically placed on the plan layout, while the cross section is automatically placed in the correct layer. 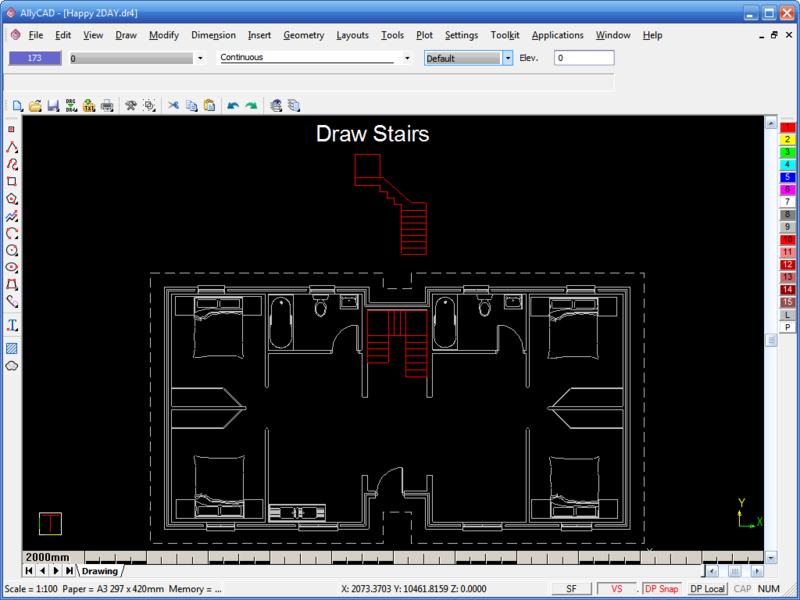 This function is used to add plan and elevations of staircase to drawings. The following options are specified in the stairs setup dialog: tread and rise dimensions and pitch angle. The staircase height and length may be adjusted according to the number of treads and tread dimensions specified, while the different railing and tread settings may be edited, saved and loaded. The landings may be added by simply indicating start, corner and end sections in the dialogue. In addition, the landing elevation may be drawn by indicating the start, corner and end sections, and then indicating the foot of the landing in the corresponding elevation view.